Like writing, baking is a process! Over the past few months, I have been doing a lot of baking. What started out as baking treats for my dogs, has given way to baking cookies for friends and family. 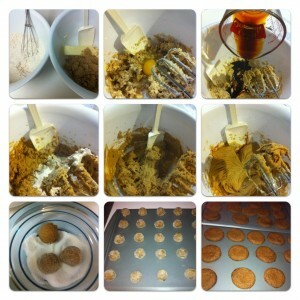 For me, baking “people” cookies started out with simple oatmeal cookies. They were easy, uncomplicated and made me feel comfortable with what I was doing. They put me at ease and afforded me some flexibility if I messed up a little bit like putting in a little too much oatmeal or used nutmeg instead of cinnamon. Once I felt like I had those down, I moved on to chocolate chip cookies, then ginger molasses cookies and finally, to the very temperamental, sugar cookies (even my mother admits that baking sugar cookies isn’t always an easy task). I’m now ready to attempt to bake pies. I’ve been putting it off because the fear of making a bad crust scares me. It’s hard to put so much work and effort into something only to have it turn out less than satisfactory. And the last thing I want to do is make something that doesn’t taste good. My experience with writing has been a lot like baking. I started out simply by journaling, then blogging. I then began doing guest blogs and now, I’m freelance writing for others. Oh, and somewhere along the way, I wrote the first draft of a novel and plan to begin a new one next month. For a while, fear was preventing me from giving myself the chance to progress to something more challenging. In writing, much like baking, you start out with a basic idea of what you are going to create (the recipe). Then you select the ingredients that are needed (words, characters, story). Mix them up together and bake. The hard part is waiting to see how things turn out! With both activities, you gain knowledge along the way as your creation comes to life. You learn what to do, what not to do, what works and what doesn’t. No two cookies or stories turn out the same. Changing the words used, like changing ingredients, can affect the outcome of the story. The beauty of it is that even if you mess up along the way, you still learn something from the experience so no attempt is ever a waste of time or effort. This weekend, I’m going to bake up some cookies to nibble on while I mix up my words, roll out my story, cut out a few characters and maybe even add a few sprinkles on top for some oomph. Writing has never sounded so sweet! Valeka Cruz (@runningonheavy) is a freelance writer and blogger living happily in Austin Texas with her three fur babies. Her weekly blog, Running On Heavy, provides health and wellness motivation along with life lessons. She loves chocolate, hiking, laughing, hot tea and, especially, writing (not necessarily in that order depending on what kind of a day it is). Hey Valeka..nice to meet another good Texas woman lol. I live about 4 hours southeast of Austin. I love your article. I am new to this blogging thing myself and I have finished two chapters on a book. I see all you successful freelance writers and wonder will I ever make it? lol. Thanks for the encouragement!! Hey Teresa! Great to meet you 🙂 I’m so pleased that you like my article! And congratulations to you on writing two chapters – that is no small task! Keep up the great work and can’t wait to hear about your book! Hi Valeka. Yummy and ‘nutritious’ post! Just last week I borrowed a cookie recipe book from our public library and want to bake some cookies in preparation for NaNowriMo, and your words have definitely convinced me to take the time to whip up some! I love this and I’m going to put it on one of my index cards,decorate it with a collage of cookies and then pin it to my bulletin board just to the left of my computer. It will remind me – on the days when I struggle with self-doubt believing I’m probably writing something that’s already been written – my story is different and worth writing. Hiya, Carole!! I can’t wait to hear what kind of cookies you bake up for NaNoWriMo! And I’m so happy that you found a line that jumped out at you! I’m honored to be pinned to your bulletin board for inspiration 🙂 Well, not ME but something I wrote – hee hee!! Oh, that is a good analogy! And now I want cookies! lol. It sounds like you’re making great progress, Valeka. Good for you! I haven’t really thought about it in this way (and I love baking! ), but boy, you are so right! Thank you, Estrella!! I’ve really gotten into baking and one day while I was in the process, I realized how similar it was to writing. So glad you enjoyed my post!! I LOVE this article. Thanks and the cookies are lookin’ good!